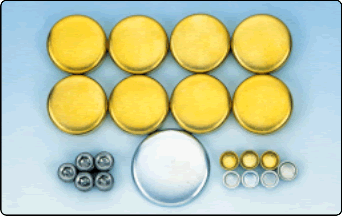 Milodon brass freeze plugs will not rot out, like lower cost steel ones. Your new engine assembly deserves the best. Don't get stuck trying to replace a leaking steel freeze plug behind a motor mount a year or two from now! Milodon kits include all the necessary external block freeze plugs, cam and oil galley plugs for one complete engine. Designed for the engine builder, this crankshaft rotating socket slips on over crank snout and enables the builder to rotate, with ease, a complete engine for assembly. CNC machined and gold irridited. NOTE: For use when dampner is removed only. These caps are an easy way to temporarily or permanently cap off vacuum ports or connections that have had the lines removed. Kit contains: (2) 1/8", (6) 3/16", (6) 1/4", (2) 5/16", and (4) 3/8" caps. Cleaning of an engine's oil passages prior to assembly is an absolute must. These brush kits will scrub oil sludge and machining debris from cranks, lifter bores and oil galleys.